Using manual copyright dates as rig releases yields the plot in red. Next rig in blue...?? 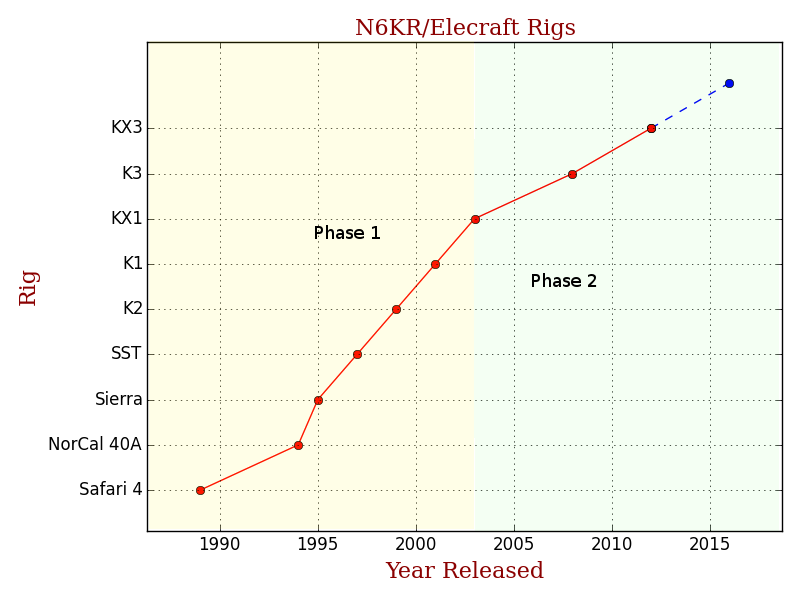 Phases 1 and 2 are my own categorization of the Elecraft rig design history. The categories are based both on Wayne N6KR's descriptions in the history below, and further illustrated by the change in slopes of development times in the graph. The dividing line is when the K3 design effort begins. Some KX1 history on the Elecraft web site. Elecraft history as written by Wayne N6KR on the Elecraft mailing list, presented below in a more readable format. Business philosophy as written by Eric WA6HHQ, also rpesented below. I am a history buff and I like to read historical accounts. I've been reading about how some ham radio manufacturers got started. I wonder if there is an "official" historical document/story/narrative about how Elecraft got started the history from inception to now. Elecraft grew out of an extended conversation Eric and I were having about whether a "modular" transceiver could be designed that would emulate the very popular do-it-yourself PC. The idea was to have a basic radio that could be customized as needed by the user. Could this lead to a successful startup? We knew there were many risks. But both of us had issues with our jobs at the time, so we dreamed up a company name and proceeded to give up our nights and weekends in pursuit of this idea. Eric and I collaborated on the first design--the K2--which represented a synthesis of our two philosophies. I had recently designed other QRP kits, including the NorCal 40A, Sierra, and SST. I wanted the K2 to be easy to build and operate, small in size, very power-efficient, and have a clean, visually-appealing design. Eric was a DX enthusiast and consequently wanted the K2 to have excellent receiver performance and "big-rig" operating features. We discussed the design for weeks, mostly by e-mail (since we live an hour apart), but also during the occasional walk on the beach. At one point we suddenly realized that what we were proposing to design was the "ultimate Field Day rig," a true dual-purpose (home/field) radio. In fact we had done Field Day together for several years, and took note of what we really wanted: bullet-proof receiver; internal battery; and an internal automatic antenna with two antenna jacks (for two orthogonal long wires). The year before starting the K2 design, we operated FD with a Sierra and two antenna tuners and an A/B switch--we were committed to cleaning up this act! In October, 1997, my wife Lillian helped me build a foam core mockup of the proposed K2 design. I drew photo-realistic color renderings of the front and rear panels, printed them out, and glued them to the foam. We even had early K2 PCB artwork glued to the interior surfaces. The entire assembly was held together with sewing pins. It still sits on a shelf above my lab bench. On October 20th, Eric and I announced our intention to start Elecraft at Pacificon, a major California hamfest. The room was packed, and my guess is that by now, probably 60-70% of the 150 people who were in that room bought K2s. We showed off the mockup and took lots of questions. The way we introduced the name of the K2 was something of a joke. Having design[ed] the Sierra and spawned something of a rash of rigs named for mountain ranges (by NorCal and other QRP groups), I swore I'd never name another rig after a mountain. So we suggested naming our new rig after the millennium: the Elecraft "2K". Since this was a QRP crowd, the irony was not lost on them--that's the model of a famous high-power linear amplifier! So we said, "OK, let's reverse the characters--K2. OOPS, another mountain...."
From that moment we started working nonstop on the design, and, frankly, compromising our day jobs. Our design skills were very compl[e]mentary. Although I had been designing radios for some time, my degree is in Cognitive Science, so I focused on the overall packaging and user-interface scheme. I also started writing firmware for the several microcontrollers to be used. Eric's degree is in EE, and he's meticulous about measuring performance. We each prototyped different parts of the circuit, and after many phone calls and e-mails, met approximately in the middle. The basic design was completed in Spring, 1998. We then sold 100 K2s as "Field Test" units, a strategy that has paid off time and again as we've released new products. The K2 was into full production early in 1999. An unsung heroine was Eric's wife, Lerma, who helped get our act on the road -- to Dayton and beyond. She was (and still is) our most dedicated roadie, taking orders, keeping us wallowing in healthy snacks, and not letting us forget when it was time to go do a talk. By that point, Eric and I had both quit our other jobs. Eric, who had been a successful entrepreneur in Silicon Valley for over a decade, started focussing on business issues. He pretty much ran things at our headquarters, originally in Aptos. I chose to work at home (Belmont, closer to San Francisco) and do most of the design work. This arrangement is perfect for both of us: I get plenty of quiet time to think about design issues, and Eric enjoys the excitement of day-to-day business operations. He likes to "design the business." I thought of the K1 as my "baby," in that it allowed me to come full circle from some of my very early multi-band QRP designs (See "The Safari 4," in QEX Magazine, Oct/Nov/Dec 1990). The idea was for it to be a baby brother of the K2, optimized for lightweight portable operation, CW only, and yet with the same "look and feel" as the K2. We also figured we needed an entry-level rig. We have grown considerably since then, adding new engineers and support staff so Eric and I could ditch some of the many hats we each wore when we first started. Key early additions included Lisa Jones, our tireless office manager; the intrepid Paul Russell in purchasing; and Gary Surrency (quite the electronics wiz) in customer support. Sometime later Bob Friess, N6CM, joined the team, helping us with the 100-W amp for the K2, as well as creating our line of transverters and most of our mini-modules. Bob is an expert in high-power and high-frequency RF design. A major milestone in our history was the KDSP2 option for the K2. Lyle Johnson, KK7P, became known to us *after* he had mostly completed this highly versatile DSP unit. He reverse-engineered the auxBus protocol and made the KDSP2 behave as if it were a KAF2, which plugged into the same spot. He showed it to us, and we immediately adopted both the product and Lyle himself. Lyle's knowledge of DSP would help propel the K3 forward. It had actually been on the drawing board for a long time. But a funny thing happened along the way to the K3: the KX1. I was a little leery of jumping right into the K3, which we knew would be a mostly surface-mount design. So we had a bit of fun in 2003 and created a multi-band backpacking rig that had *some* SMDs, but was still mostly through-hole. The T1 autotuner, another test vehicle for new fabrication techniques, was of this same vintage. The T1's optional control cable for the FT817 was the most difficult things I'd ever built, with a dozen 0402-sized parts packed onto a fingernail-sized PCB inside a mini-DIN connector. After that trial, I was ready for anything. Bring on the SMDs! The K3 design evolved rapidly with Bob Friess and Lyle on the project, and we began serious work on it in 2004. The stakes were high, and our goal was to beat the K2 by a wide margin. Eric was instrumental in refining the feature set. He also scaled up our lab gear, since even testing such a radio would prove challenging (due to its high dynamic range). While Lyle and I dug in on system architecture, Bob prototyped the RF/IF strip, including the 10-W and 100-W amp modules. Packaging was a major challenge; I had to design everything from scratch, including the knobs, display, switches, etc. The learning curve was steep, and we were all back to wearing a lot more hats. Lyle and I settled into firmware development (MCU for me, DSP for him) in 2006, and by 2007 we were ready to commit to a production schedule. We had a fateful meeting about production early in 2007 with our PCB assembler in Monterey. I'll never forget the look on the face of the owner when we told him what we were going to do. He said, "Wow. This is really big for you guys, isn't it." Yes, it was. The commitment to parts inventory alone was pretty staggering. We all signed up that day (not quite a blood ritual, but that's how it felt), opened our wallets, and prayed. Of course we had such great customers, and such enthusiastic field testers, that we were pretty sure the risks were worth it. Somehow our core focus group of about a dozen VIP contesters and DXers managed to keep the project secret right up until the last minute, and we caught everyone by surprise when we announced the K3 later in 2007. Clearly there's a Part II to this story featuring many of our more recently added staff and newer products. But for now, back to my bench. I'm always amazed when I hear comments like your friend made about us. It must be our focus on direct, and personal, customer contact that leads some people to think we are still a tiny company. 1. Since shipping our first K2 from Aptos in January of 1999, Elecraft has grown into a healthy multi-million dollar high-tech company with a broad product line. We have -zero- debt, own all of our inventory, and have a healthy, and very stable, balance sheet. We build our products here in California, just outside of Silicon Valley. We are structured to be here for a long time, and certainly longer than most hams keep a particular rig. We want Elecraft to outlast both of us. 3. How did we do that? Elecraft designs great, high value, products that are fun to use. And our products, like the K3, continue to improve and get new features even -after- you buy them. We run a stable and tight financial ship - carefully trading off an internally financed growth rate versus risk and cash needs. We work hard. We hire great people who continually amaze us with their intelligence, creativity and work ethic. Our customer support team is one of the best. And we enjoy our work. 4. We also carefully listen to, and interact with, our customers daily. We are focused on being the most responsive, and fun, ham radio company to buy from - period. 5. Wayne and I are both healthy guys - a very long way from retirement. We are having a great time bulding and running Elecraft, and plan to do so for some time. But we are not the only people who continue to make Elecraft successful. 6. Our well staffed engineering design team is diverse and strong. I'd wager that it is as large as, or larger, than many HF rig design teams at our competitors. We are well past two guys doing all of the design in our basement labs. Our engineering, support, manufacturing and management people are top notch, with a lot of depth. We have a great team and plan to keep building it for the long haul. 7. We haven't been a 'QRP Only Company' for some time. Yes, in 1999 we first targeted at the QRP market since it was tightly focused, easily marketed to, and was our fastest path to a first product. Its still a great market, too. But we always planned to also offer 100W high-performance rigs, both kit and factory assembled, to compete against the best HF rigs from other QRO manufacturers. That's the major part of the market. I think you can agree we have more than succeeded in that area with the K2 and now the K3. The majority of our rigs go out the door at 100W. We are continually designing a diverse product line, ranging from QRP to QRO. The KPA500, now going into field test, is definitely -not- QRP ;-) But stay tuned for more QRP offerings too! 9. Most important, we have incredibly enthusiastic and supportive customers. You make it fun for us! By telling your friends about Elecraft, the K3, and our other products, you keep us in business every day. You are our best salespeople. The more you enthusiastically tell your friends about our products, in person and on the air, the more new products we can design and sell. In today's economic environment, more than ever, this is incredibly important to us. Please - keep up the great work. We really appreciate it! I am reluctantly writing this email to the reflector with a very dangerous subject line....but here it goes. He said, "I think Yaesu, ICOM, and Kenwood will still be around in 10 years. Will Elecraft?" I responded, "Heck who knows? Did you ever think Drake would leave the business or Heathkit kick the bucket? Do you think Ten Tec is going to be around in 10 years? And why do thing the Japanese companies would be any better once you realize General Motors took it on the chin this year." He said, "I am not sure I want to buy a rig from a QRP company or any company that is owned by two guys. What happens when they retired or die?" I replied, "Elecraft has their roots in QRP which is a great deal for how they design their radios, small, compact, and low current drain. They are hardly an exclusive QRP company. But, heck, who knows who really owns some of the other companies, it is just that we know more about Elecraft because they are very communicative. I don't see a lot of people having direct communication with the owners, designers, engineers of the other companies. Besides, I am sure they have made plans for the future, most companies do." My friend said, "Yea right." So, after this long email explaining the conversation... How do companies, like Elecraft, Y, K, I, and T, protect their customers in the future knowing that in 10 years things could have gone south or the principals might have "moved-on?" Or, like everything else in the world....you spin the wheel and take your chance. No guarantees! I like the two guys from California...I wish them long lives.